Cantor’s Driving School offers private, one-on-one, on-the-road driving lessons 7 days a week, day and evening hours. Door-to-door service is provided – we pick you up and we drop you off at your school, work, house or apartment. Cantor’s Driving School offers night driving lessons in the evening hours. (Of course, Cantor’s Driving School has daytime lessons too). From Monday to Thursday, Cantor’s Driving School’s regular hours extend to to 8:00 PM, so lessons can be scheduled late in the day. Note: in the summer, night lessons are typically not scheduled since it’s not dark until late in the day. 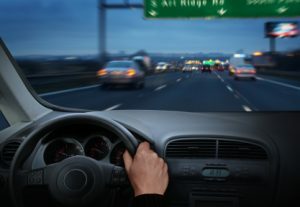 Cantor’s Driving School recommends at least one night driving lesson to gain valuable driving experience during dusk and early evening when visibility is lower. During night driving, drivers need to learn to navigate the car in darker conditions with the headlights on. Of course, you will be driving at night after you get your license, so it’s good to practice with Cantor’s Driving School now. If you purchase one of Cantor’s money-saving packages of driving lessons, it’s a good idea to schedule one of those driving lessons in the evening to get critical night driving experience that will be very helpful in learning to drive safely. Cantor’s Driving School specializes in teaching students how to drive with defensive driving techniques – check out the Cantor’s Driver Training Lessons and Packages page for more information. Over 50,000 drivers have learned to drive and successfully passed their driver’s license test using Cantor’s Driving School. More than 50,000 drivers have benefited from using Cantor’s Driving School’s professional, experienced instructors. Cantor’s Driving School has been teaching teens and adults to drive for over 30 years! Cantor’s Driving School is a Nevada State registered driving school and all Cantor’s instructors are Nevada State certified instructors. Cantor’s Driving School can help you to learn to drive and get your driver’s license. We know how teens learn to drive because we have taught thousands of teens to drive and helped them pass their driver’s test. We pick you up at home or school for a two- hour private driving lesson, take you on the freeway and in traffic, provide good driving tips along the way. Cantor’s Driving School instructors teach safe driving while you gain valuable road experience, and we teach you how to parallel park. Cantor’s driving instructors are teachers. We customize each lesson to what you need to learn and do it in a fun, interactive way. We help you relax and focus on good driving principles. We will help you pass your driver’s test on the first try! Cantor’s Driving School offers driver training, evaluations and certification programs for drivers of company cars. Driving lessons can be provided on a case-by-case basis or corporate training/certification programs can be established. Call Cantor’s Driving School at 702-985-7993 to discuss. Cantor’s Driving School serves the Las Vegas NV area in Clark County, including Summerlin, Henderson, North Las Vegas, Boulder City and Paradise. To get started with driving lessons, call us at 702-985-7993 or use our convenient contact form.